In the next few months, families dealing with food allergies will have two excellent opportunities to learn, share and meet others dealing with the same situation. 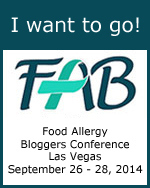 I already mentioned the upcoming FARE Conference, and now the second annual Food Allergy Bloggers Conference line-up has been announced. There are some excellent speakers scheduled to attend, including Joel D. Warady from Enjoy Life Foods; Alisa Fleming of GoDairyFree.org; Dr. Ruchi Gupta; Dr. Xiu-Min Li; and Lori Sandler of Divvies. It’s set for September 26–28, 2014 in Las Vegas and it sounds like it will be a combo of fun and informative. Anyone going?